Jaimie is full of surprises sometimes. One of those surprises is tucked away, hidden in the kitchen where she spends a lot of her time. 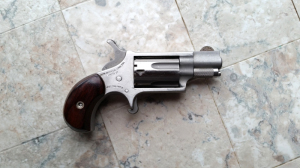 I’m talking about her .22 caliber North American Arms mini-revolver. When we lived in the city, the small pistol was kept by the side door where we would receive the most foot traffic. It was tucked away on a shelf away from curious children, but accessible for us should we need to get it quickly. A pistol is only for shooting your way to your rifle, that you should’ve had with you in the first place. This little gun holds the title for the smallest gun on the homestead. Both Tim and I (Zac) have a few of what could be considered “back-up” guns, but Jaimie owns the smallest one. This little gun is indeed what is known as a “shoot and get away” gun. It’s not meant for combat, it’s not meant to win a gun fight and it’s certainly not meant as a primary defensive weapon of any sort. It’s a last resort pistol. I actually got this gun brand new in a trade a few years ago when I was designing a website for a gun shop. They decided to pay me in merchandise and I thought that was a great idea! This little gun was included in the package. There have been numerous times when Jaimie or I have grabbed this little guy and stuck it in a pocket while heading out the door. We first got our concealed carry permits when I was finishing up college many years ago. And we certainly both have primary defense weapons that we normally carry. However, on certain occasions when attire or circumstance just won’t allow for that, this little guy comes in handy. This .22 mini revolver plays the same roll on the homestead as it did when we lived in the city. We live on a working farm and we live way out in the middle of nowhere. All of us are armed for a number of reasons. I go over some of those reasons in another article here. The main purpose of this gun as stated above is to “shoot and get away”. In our case, it would be to shoot, get away and get a bigger gun. There are plenty of gun snobs out there who will tell you that this gun is worthless with so little firepower that there is no point in owning one. 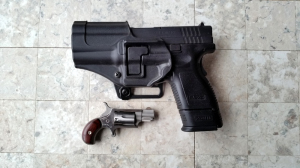 If a struggle had ever taken place while I was carrying this gun, bringing the barrel to the ear of an attacker or shooting close range to the chest would certainly work to buy time to escape the situation and seek help. What are the stats on this gun? The cylinder of the gun comes out completely to make for easy loading, but not fast loading. There is no loading on the run with this gun. This is another reason why it’s considered a “shoot and get away” firearm. The pistol is completely stainless steel with solid craftsmanship. The cylinder has half-way notches that allow the hammer to rest without fear of accidental discharge. If you are interested in obtaining one for yourself, the price is often less than $200. The reality is that the bullets coming out of this gun probably don’t even reach full velocity because the barrel is so short. Most of the powder actually burns up outside the barrel and so the bullet never reaches full speed. I load ours with CCI stingers and they have been tested in this gun at reaching 800 feet per second. I think is really good considering the size of the barrel. Bottom line, is this gun a man stopper? Not really. But it does meet the first rule of going to a gun fight. Bring a gun. My wife and children are my top priority. Their safety is paramount and when they are out, they need to be safe. The homestead needs to be safe too. My children are growing up learning about life on the farm. Part of that means knowing how to respect and use firearms. They are a part of our daily lives here. Our firearms are used for protection, meat harvesting and even entertainment and sport from time to time. We have big guns and little guns. 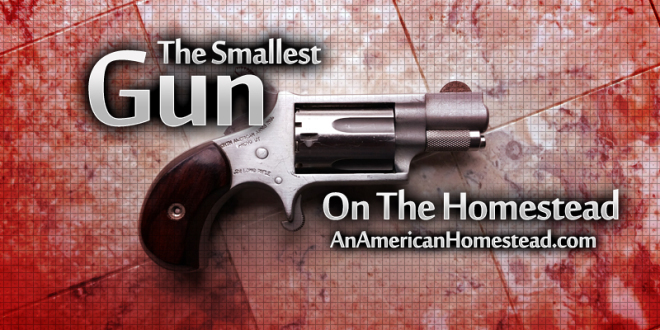 This neat and tiny mini revolver is one of the smallest pistols in the world and it has a place on An American Homestead. Please rate and share our article. Thanks! 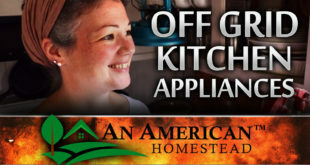 Zachary lives with his wife, two sons and his wife's parents on An American Homestead deep in the mountains of the American Ozarks. They all moved there together in July of 2013 where they began to build the homestead. They are off-grid with the exception of a phone line. my go to gun is a .22 also. I’ve had a larger caliber gun but just can’t get comfortable with it. Fits with my CCW for the same reason. That’s freaking ADORABLE! Lol, I know it’s weird to call guns cute, but this one is so cute. I love my sig sauer for my primary, but something like this would be such a cool gun just to own for fun, or have as a back up! I look ridiculous, 6’5″ 350lbs, when holding my NAA Black Widow in 22WMR, but it has become my primary carry gun because of it’s ease of carry. A good pocket holster, and it tucks away anywhere. It is accurate and loud, really loud, perfect for getting to a safe place or another gun. It also dispatches varmints with ease, and is Made in the USA in Provo, UT. Great guns. Nothing wrong with a small caliber, I keep a small 22 semi nearby at all times. 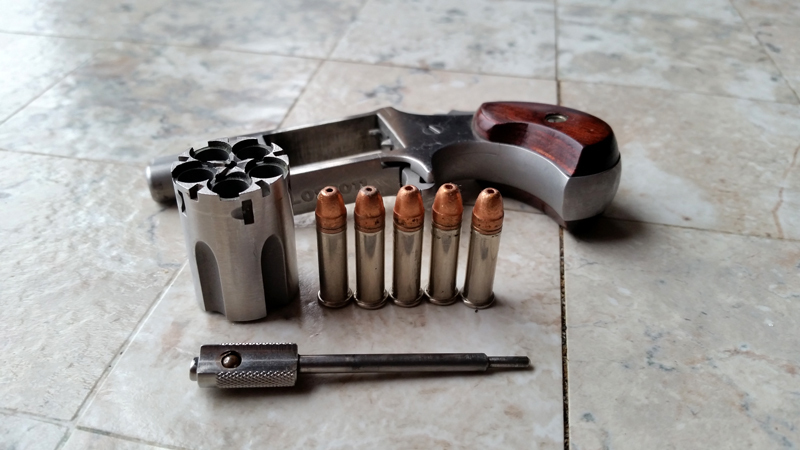 I have carried a mini pistol in .22 magnum for 20 years. It lives in a kydex sheath around my neck. The piece is strictly defensive. Since carrying around a cop or rifle is not practical, this mouse gun is way better than a bowie knife in many circumstances. Fires in a six inch circle out to fifteen feet. That is plenty accurate for most gun fights. The lack of quick reloads is a problem but you do have six rounds to get the job done. 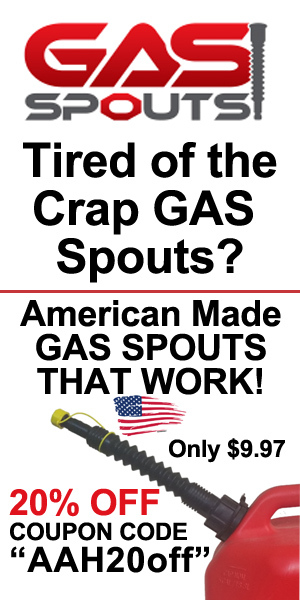 Stainless steel, made in U.S.A., cheap, easy to carry (neck, pocket, or purse)…what’s not to love? If they are so sure its useless let them stand there and take a shot from it at 10ft. 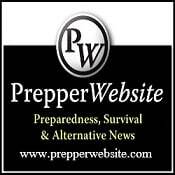 What caliber side arm do you suggest for any untimely confrontation with a bear or a boar on the homestead? 9mm is fine if you have a lot of rounds. I would never carry a .45 with only 7 rounds on my homestead. If you’re in grizzly country, the biggest gun you can carry. You can leave a bitcoin donation while your here.